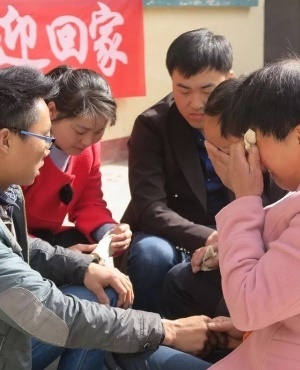 A Chinese man who was abducted 21 years ago has finally found his parents. Xu Wenbin, who's now 29, was reunited with his biological parents last month after last seeing them in 1998. A man abducted Wenbin one day while he was on his way home from school. He was then renamed Zhang Hao and sold to a family almost 1 200km away from his native hometown in Hanzhong city. Although Wenbin spent two decades separated from his parents, he always remembered them and dreamt of being reunited with them. His mother and father spent years searching for him alongside police, but to no avail. In 2000 the family decided to give police DNA samples to input into the national database but the miraculous breakthrough came only last year when Wenbin also submitted his DNA into the database. Ji Shaojie, a police officer who worked on the case, explains that DNA technology wasn’t sufficiently developed at the time of the kidnapping but when Wenbin also submitted his DNA into the system and it was a match, they had no doubt they’d finally found him. Police then confirmed his identity through further DNA tests and finally brought him back home on 28 March this year. The heartwarming reunion was captured on video. While it's unlikely the individual who kidnapped Wenbin in April 1998 will be caught, it’s unclear whether the parents he grew up with have been charged.